So we spent the whole day around the Salton Sea area today. Some fantastic wetland birding again with colossal numbers of ducks, waders and gulls which are probably my favourite groups of birds. Salton Sea is well known for being the only regular spot in the whole US for Yellow-footed Gull. The best numbers are found during the summer months and I assumed that we would be extremely luck to even come across a single bird at this time of year. By midday we had managed to find a first-winter, a second-winter and up to four adult-types! Most of these were found on the saline pond at the Sonny Bono Salton Sea National Wildlife Refuge or nearby on the lakeshore. We also had nice views of Ross's Geese in amongst the Snow Geese but there didn't seem to be any young Ross's present. We also had a single White-fronted Goose here which may have been Pacific White-front Anser albifrons sponsa which seems to be the best fit. It was the only one that we saw at Salton Sea. At the Sonny Bono visitor centre we had some close views of Gambel's Quail which seemed to be feeding on grain laid out especially for them. To finish up the day we headed to Unit 1 of the Salto Sea NWR. We had more Ross's and Snow Geese along with Sandhill Cranes in the adjacent fields. The marsh beside the lake was full of duck, Pintail in particular but we also saw good numbers of Black-crowned Night Herons, a single American Bittern in the near darkness and heard more Ridgway's Rails. American Bittern, last bird of the day. Greater Sandhill Cranes with a single Lesser Sandhill Crane? Ross's Geese with a juvenile Sow Goose on the left in the background. Ross's Geese with a juvenile Snow Goose on the right. Ross's Geese in amongst Ring-billed Gulls, not a huge size difference! Single Snow Goose in the top right corner. Mostly Snow Geese with a dark morph bird in the centre. Nearly all the Snow Geese seen were white morphs. White-fronted Goose with juvenile Snow Goose. First-winter Yellow-footed Gull, the white underparts really made it stand out from the other young large Nearctic gulls. Adult Yellow-footed Gull on the left with a first-winter Thayer's Gull on the right. Yellow-footed Gull on the right with a California Gull on the left to compare upperpart tones. 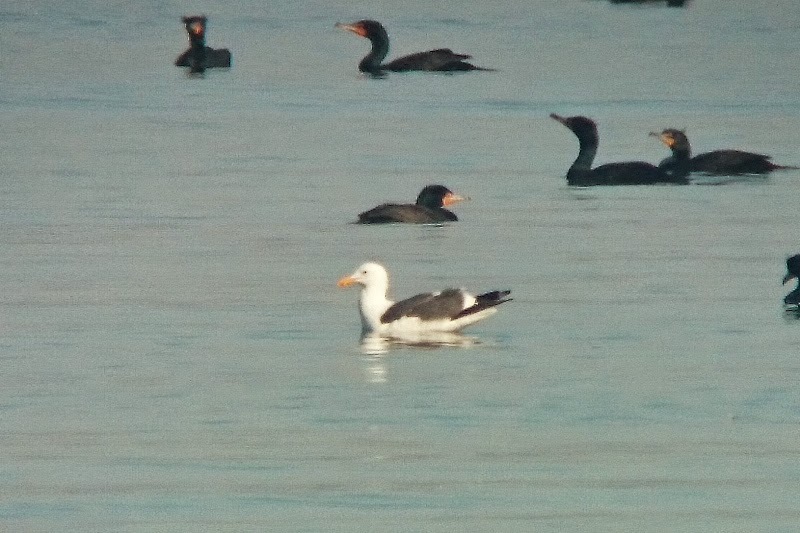 Phone-scoped pic of a different Yellow-footed Gull.